Tuesday’s terrorist attacks at a Brussels airport and metro station (coincidentally next to NATO and EU headquarters) has all the hallmarks of a false flag event – designed to further the New World Order agenda to push through Orwellian domestic laws, surveillance, and justify ongoing wars in the Middle East. Early research suggest there are four clues pointing to a false flag: the ‘convenient’ timing of the event, NATO’s involvement, the location, and the symbology around the attacks. Strangely enough (or not), I was just having the thought the day before the Brussels attack happened that it had been awhile since the last major false flag attack had occurred (a few months since the2nd Paris false flag attack and the San Bernardino false flag attack). I had the distinct feeling that another one was just around the corner. When you regularly cover false flag events, you begin to see the greater pattern behind them. The New World Order manipulators need constant chaos and fear to rule, and to shape the world in the way they want. They live by their motto “Ordo ab chao” or “Order out of chaos” because they know that they can impose more restrictive laws, policies or agendas on the public when people are more emotionally disturbed and ruffled. They have to stir up “crime” to justify “order”. They have to continue injecting stories of fear into the MSM (mainstream media) to keep people in a constant state of worry and anxiety, or else people begin to forget the supposed threat of Islamic terrorism, ISIS, Russia, communism, manmade global warming or whatever the bogeyman flavor of the day is. 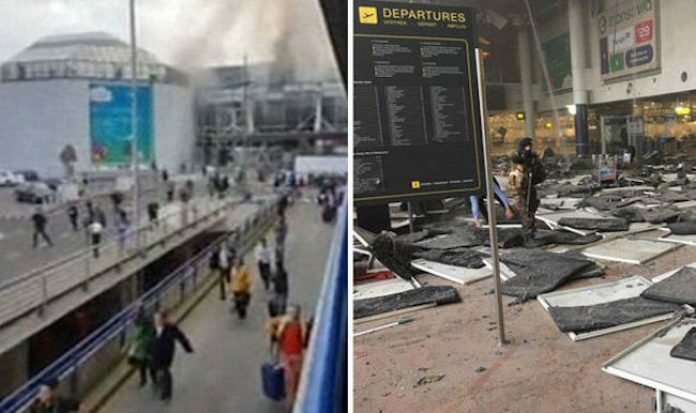 The timing of this Brussels attack is convenient for quite a few reasons. Firstly, it comes 5 days after Turkish dictator Erdogan predicted that Brussels could be the next bombing target after Ankara. He actually said that “there is no reason why the bomb that exploded in Ankara cannot explode in Brussels, in any other European city.” Was this foreknowledge showing that Brussels is a false flag operation? Is it just a coincidence that Belgian Prime Minister Charles Michel said“What we feared has happened”? Fourthly, it’s always important to consider the numerology of these events. The attack took place on March 22nd (full moon) which is written as 3/22 in American English. Those familiar with Secret Societies may recall that 322 is the number of theSkull ‘n’ Bones Society whose members have been reported to have engaged in dark Satanic rituals. George Bush Sr., George Bush Jr. and John Kerry are all “bonesmen”.